I've received quite a few questions in recent weeks and months about the nuts and bolts of how our cooperative preschool works both from people considering starting their own cooperative or seeking to incorporate more parent participation within their existing classrooms. If you're entirely unfamiliar with our model, please take a look at my Cooperative Manifesto in which I attempted back during the dawn of this blog to provide a sort of socio-economic-political context for what we do. And if you include this post, I will have now written 44 pieces on various aspects of what it's like working in a cooperative preschool, which you can find by either clicking on the "cooperative" tag in the right hand column under "Teacher Tom's Topics," or just clicking here. So, there's plenty of further reading should you really want to delve into what I've had to say on the topic so far. So you're thinking about starting your own cooperative preschool . . . I'll begin with what the cooperative model is not. It is not a pedagogical approach like Reggio Emilia or Montessori, but rather a structural model for how to organize an entire school from the classroom right through administration, enrollment, and teaching, to maintenance, purchasing, and janitorial. Our school has a progressive, play-based curriculum, but a co-op model could accommodate any type of pedagogy from one of rigorous academics (not recommended by this blogger) to democratic education or "free school" (highly recommended by this blogger). The fundamental characteristic of a cooperative is parent ownership and management. Once you've signed your parent agreement and paid your tuition, you are an equal owner of the school along with the other families. From there, theoretically, anything can happen, but all the co-ops I know about are characterized by a professional teacher, supported by a high level of active parent participation in the classroom and other day-to-day operations. Many people have written me after having researched their area, found it lacking in terms of cooperative options and wondered how I would suggest going about starting one from scratch. I've never done this before so understand that this is really just an educated guess about the best way to go about it. The original co-ops founded back in the 30's and 40's didn't even hire teachers. They were simply groups of parents who took turns hosting the "school" in their homes, garages and backyards, cobbling together a curriculum from their own reading and instincts. I'm sure that many of them included former teachers in their membership. I doubt they asked anyone for permission to do this. I'm no lawyer, but this may still be a credible option for many of you. And that may be enough, but in any event this could at least be a way to get started. If the idea is to create a more formal school with a proper facility and professional teacher, I could imagine that these in the home school days could be structured so that 3-4 parents handle the "classroom" while 3-4 parents, in another room, tackle the nuts and bolts of building a cooperative school. I would then think you would want to get busy making sure it's even possible to do what you envision. Not only do the laws and rules surrounding schools and incorporation and regulations vary so widely from state-to-state, not to mention nation-to-nation, that it's very possible that the kind of cooperative I write about could literally be illegal where you live. You may have to buy and hour or two of a lawyer's time to sort this through, but if you're doing it on your own, I'd suggest taking a look at regulations surrounding non-profits, cooperatives, home schooling, and the school regulatory policies in your area. Are there any schools in your area that are in any way similar to what you envision? It might be a good idea to talk to them. And understand that it may take a great deal of creativity to come up with just the right structure to make a cooperative fly where you live. Our own school avoids many of the more onerous regulatory requirements by running as a half-day program and by legally operating as 3 separate schools. What you learn from this process will impact to a greater or lesser extent the exact shape of your cooperative preschool, but I suspect that there is a legal set-up possible in every part of the US that would allow for a workable version of a cooperative. I can't speak about other countries, but when I was in England last fall, I was told by several people that our model would be flat out illegal there. Then two of my fellow conferees came up to me after a presentation to let me know that cooperatives do in fact exist in England and that they indeed work at one, so I really don't know. I don't know if this getting started post will be helpful or not. 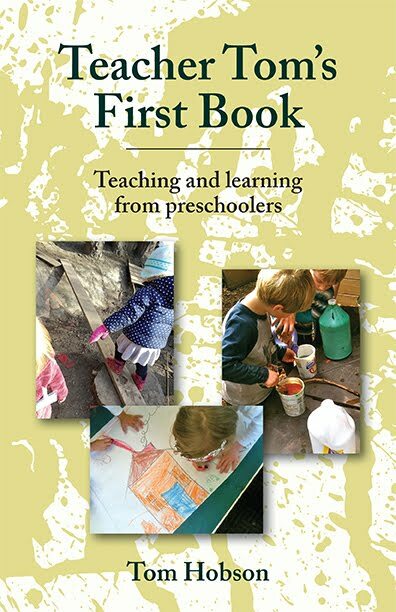 It's the part of this topic I know the least about having had the good fortune of living in a part of the world with several robust and well-established systems of cooperative preschools. In the coming days I will cover the parts of this about which I consider myself an expert such as the parent role in our school, their rights and responsibilities, parent education, and the dynamic between me, the professional teacher, and our parent-teachers. I can imagine that this will cover 2-3 more days, so stay tuned. Thanks Tom - this is really interesting. I think part of the difficulty is that here in the UK we may have a different terminology. For example, back in the Eighties I visited a cooperative preschool where the focus was on cooperative play rather than a cooperative structure to the set up. In Sweden (where I'm going on Thursday - yay!) the outdoor schools are free schools. To help get outdoor schools started, the Friluftsframjandet organisation (the society for promotion of outdoor activities) have a specific outdoor school group that provides advice and support to overcome all the red tape which exists. It also means that practitioners can meet and get to know each other as everyone who works in an outdoor school or nursery belongs to this organisation. Does such an organisation exist in the US for cooperative schools? Our school has been around since the 40s, but there are others that have been around even longer, infused with the spirit of the democratic model through and through. I am going to tweet this because I think you have so much good information to share. I love how you help others : ) You are a blessing Teacher Tom. I'm so happy with your blog site, it contains all the matter with regards to Best Kindergarten school Good luck to you and your well performed job. Thanks for keeping us updated with the latest information for Kindergarten school. Hi form New Zealand. Have you heard of Playcentre? It is New Zealand co operative preschool. We have been around since 1941 and still going strong with 481 centres around New Zealand. All run by a national federation and fully funded by our Ministry of education. Parents are the teachers and are funded also by the Government to train to various stages in early childhood education for a Playcentre Diploma. Some centres also hire ex Playcentre trained parents though. Our sessions are all free play and mixed age. We make all the decisions using a consensus process not just at centre level but right through to the national executive. Anyone wanting information on this could contact our Federation for information. Love your blog Tom. Have been using some of your ideas at our Playcentre. Sleep deprived mums and dads need these kinds of ideas to help them keep the energy and enthusiasm up ! Amazingly written. The article shows a lot of research and is very informative too. For those who want to start a preschool, business must go through this article. I will personally recommend them to read. Why Don't We Just Pay Parents?